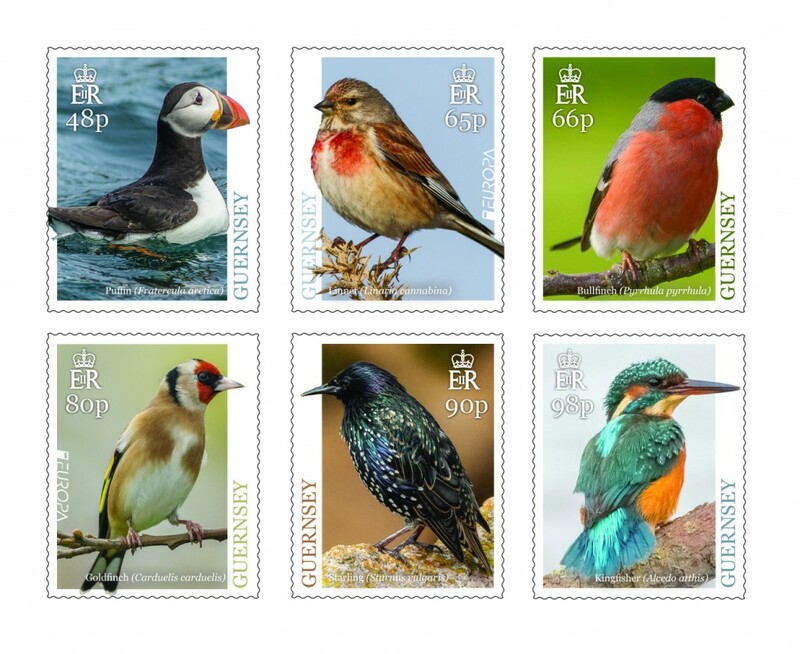 Stamps featuring stunning photographs of birds found in the Bailiwick of Guernsey are to be issued by Guernsey Stamps for its EUROPA issue. The set includes two Europa stamps, which incorporate a special feature for smartphone users, as they can be scanned to hear the sounds of the birds. (issue date: 1 April)Captured by local birdwatcher Rod Ferbrache, the first stamp in the series features the (Atlantic) Puffin (Fratercula artica), a member of the auk family, which, with its large colourful parrot-like beak, is an unmistakable seabird (48p stamp). The Bailiwick of Guernsey, namely Sark, Herm, Jethou and Burhou, is where the most southerly breeding colonies can be found. By August the puffins leave the Islands to spend the rest of the year in the middle of the ocean. The 65 pence stamp depicts the (Common) Linnet (Linaria cannabina), which gets its name from the Latin for flax, Linum, one of its favourite food sources. The male is the most striking with its crimson chest and forehead, grey face and grey bill, while the female has subtle brown and beige plumage. 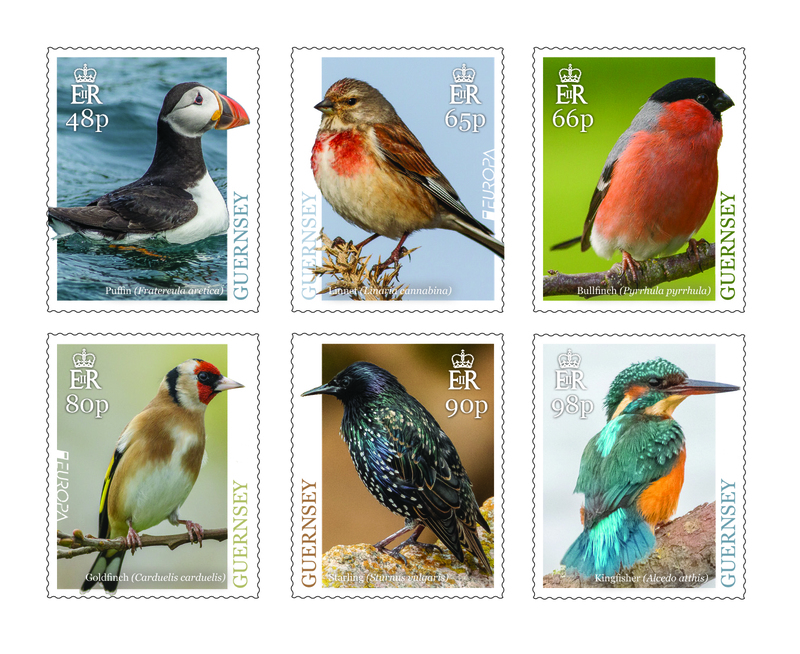 The 66p stamp features the (Eurasian) Bullfinch (Pyrrhula pyrrhula) is one of Guernsey’s few true resident birds. Named after its heavy looking bull-like neck, it is one of the most striking types of finch with the male sporting a bright crimson chest and a jet-black cap. The (European) Goldfinch (Carduelis carduelis), depicted on the 80p stamp, is sometimes referred to as the seven-coloured finch. Unmistakable with its red face and black and white head, as well as striking black wings and broad yellow wing bar, the Goldfinch has become the success story of garden bird feeding. The 90 pence stamp features the (Common) Starling (Sturnus vulgaris), which can be described as being gregarious in both song and habit, mimicking the sounds of the bird world with their many whistles and squeaks. The birds’ vivid emerald and iridescent violet plumage disappears in the breeding season. Completing the series is the 98p stamp featuring the beautiful (Common) Kingfisher (Alcedo atthis), once trapped by hat makers for its colourful plumage. These shy birds can be found fishing in freshwater and coastal sites in the Bailiwick in the winter, catching their fish and knocking them unconscious against their perch before swallowing them whole. Bridget Yabsley, head of philatelic at Guernsey Post, said: – “We’re delighted with this special EUROPA issue, created with the help of the local man with a bird’s eye view of the Island’s frequent fliers. The stamps are available to pre-order from 18th March 2019 at www.guernseystamps.comor by contacting Philatelic Customer Services on +44 (0) 1481 716486.